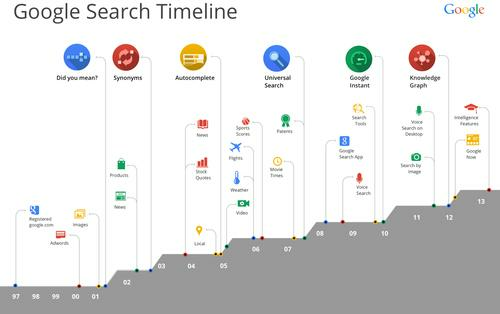 Google search through the years, as told by Google. Google is now 15 years old, and the company is celebrating by smartening up its bread-and-butter technology, search, and adding new features such as comparisons and filters. The new features are part of an advanced search ranking system that Google has been rolling out over the past several months, called "Hummingbird." Hummingbird, a Google spokeswoman said, is designed to make users' search results more useful and relevant, especially when they are asking the search engine long, complex questions. Not too complex, though. The query, "What is Google planning to do for its 20th birthday," did not produce any definitive answers. Instead, Google used more simple queries to show how the new search tools, announced Thursday, work. To start, Google is adding filters and comparisons to search. Both tools are designed to improve the intelligence of Knowledge Graph, Google's developing technology to better understand search queries in their natural language, said Amit Singhal, senior VP of search. The comparison tool does not work for all searches. A search for "compare Google vs. Facebook" did not present any such grid in its results. The filters tool is meant to tackle questions that have multiple answers and let users dive deeper into each result. For example, users can search for "impressionist artists," and a horizontal panel will appear at the top of the results page displaying photographs of people such as Claude Monet, Edgar Degas and Mary Cassatt, which people can click on to learn more. With the filters button, users can change their search to examine other styles of art, such as baroque or abstract. The tool can give results for a broad range of topics. Top postmodern authors? The panel of photos starts with Don DeLillo, David Foster Wallace and William S. Boroughs. Los Angeles Dodgers pitchers? Brian Wilson, Clayton Kershaw and Ricky Nolasco. But like comparisons, the filters tool does not work for everything. A search for "technology CEOs" yielded nothing, and neither did "James Bond villains." The company will also be releasing a new version of its Google Search app for the iPhone and iPad to help those devices better communicate with each other. With the update, people will be able to use one device, such as a tablet, to create a reminder of what to buy at the grocery store. Then, if the person walks into the store with a different device, such as an iPhone, a reminder will pop up. The updated Google Search app is coming in the next couple of weeks, the company said. Finally, the company is applying some cosmetic changes to search on mobile phones and tablets, to take out some of the clutter and present the search results on cards, "so you can focus on the answers you're looking for," Google said. The search upgrades were presented Thursday by Google's Singhal, not on the Google campus but at a house in nearby Menlo Park, California -- Google's original "headquarters."